What I mean is that each one of you says, “I belong to Paul,” or “I belong to Apollos,” or “I belong to Cephas,”or “I belong to Christ.” Is Christ divided? Was Paul crucified for you? Or were you baptized in the name of Paul? This piece is emblematic of that destructive tendency. I won't be commenting about the endeavor of Michael Voris and Terry Carroll. Though I will say that Michael Voris was very nice to the American Heritage Girls troop my daughters are in when they visited his studio, and he seems to be a decent man. I know one other person who has helped at CM, and he's also very decent. I have mixed feelings about the apostolate as a whole, but that's not what this post is about. The most notable thing about the soul-bearing essay is that, at the end of the day, the author is simply switching from one cult of personality to another. He's still identifying himself and his spirituality via a hero-figure--from "Vorisite" to "Barronite." That's not good, he says with English understatement. If the young man were interested in my recommendations, I'd suggest that he look for a solid parish men's group or Knights of Columbus council, work in the parish food pantry, and stop putting his trust in media princes. Rancid carnival barker and all-around POS Donald Trump has proposed that we bar entry to the U.S. of all Muslims. This is clearly a garbage policy from a garbage human being, unworthy of consideration. However, there is one thing that can be said for it: had we been doing it a year ago, Tashfeen Malik, the murderous jihadi sow who abused our hospitality and came to our country to slaughter us, would not have been able to do so. It is--however odious--the only proposal that would have definitively prevented the slaughter, or at least lessened it. If she hadn't been here, she wouldn't have murdered anyone. Nevertheless, many of us oppose Trump's cynical, atrocious ploy (self included). At a minimum, it stabs in the back those Muslims who have helped us and would pay the price if they were left in their homelands. When you have a moral debt, you pay it. Period. Beyond that, some have invoked higher ideals, arguing that it would offend our sense of who we are as a nation to implement it--that, despite the risks, we would be killing something that makes us different, betraying who we are. Sure, some will probably turn on us and kill us, as did the sow--but the alternative is worse. So stop talking about wanting to "do something" about my firearms. "Having a clear faith, based on the creed of the church is often labeled today as 'fundamentalism.' Whereas relativism, which is letting oneself be tossed and swept along by every wind of teaching, looks like the only attitude acceptable to today's standards." The family of Lexys Lamp is struggling with her loss and the medical bills for treating her cancer. Lexys' mother and her teacher say they never heard her complain about her disease, the nearly 50 radiation treatments she endured or the endless stream of doctor's appointments. "She was always bubbly and courageous," Kerby said. DIPG is exceedingly rare. Lamp said she knows of only four other cases in Michigan. Lexys died at home in her mother's arms. She was initially pronounced dead shortly after 2 p.m.
"We were standing there and had hospice and the pastor. I started hysterically crying. I said at that point that I couldn’t live without her," Lamp said. Suddenly, Lexys started breathing again. The color came back to her face. She had a heartbeat. The bounce-back was only temporary; she died at 3:30 p.m. But to her mother, it was a comforting sign. Here's the GoFundMe link: they are looking for $15,000, and are about 80% of the way there. Happened to me four times over the course of a week a few years ago. Thank God I wasn't behind the wheel any of those times. Get well soon, Rep. Levin. There's something purported to be a rebuttal of the 1P5 piece out there. I'd never heard of the blog in question before, and I'm not going to give it oxygen by linking to it. However, it's a pastiche of frenzied material taken out of context (oh, the irony!) using "WAR IS DECLARED" sized font which predictably flounces off in a snit at the end. Oh, and he first shrills at the far more estimable (not to mention reasonable) Carl Olson's more measured criticism. No, really--that's the intellectual integrity of it in a nutshell. Unable to rebut facts, he tries to punch up. For me, the only part that merits a response is where the fraud in question accuses me of suggesting that the pope should be subjected to violence. My response? I'll let Tommy Lee Jones answer for me. Fair warning: the OnePeterFive piece regarding the current pontificate contains sweeping and judgmental quotes, observations and one-sided anecdotes--and some of my commentary is likewise. All the pictures save the first are from yours truly. More seriously--yes, it is a polemical take. And? If you're interested in arguing the facts, or offering rebuttal facts, fire away. If you're interested in being my spiritual director, I'll pass. The interpretive key to the piece is the word "convert." The "Bishop's Mansion" of Detroit. (Photograph owned by the Detroit News). 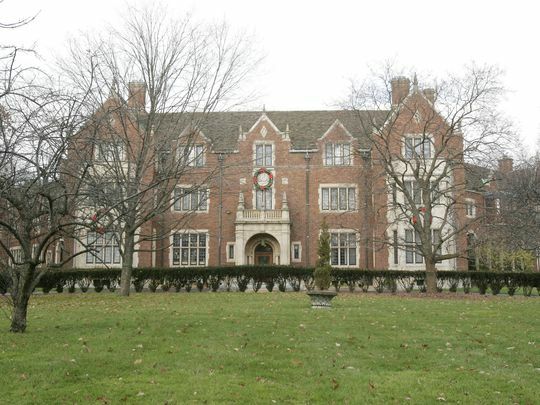 For those who, more or less forgivably, associate Detroit with "ruin pR0n," the discovery of a gem like the former diocesan mansion in Palmer Woods is a salutary tonic. 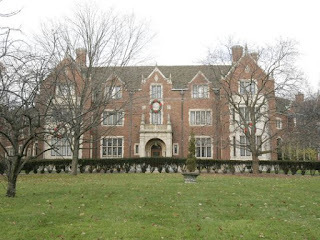 Built in the mid-1920s, this 35,000-square-foot Tudor Revival was built by the Fisher brothers [early automotive pioneers and Detroit benefactors--Editor] for the Archdiocese of Detroit to serve as the home of the presiding bishop. Now owned by Great Faith Ministries International, it’ll serve as party headquarters at the end of Saturday’s tour, where ticketholders will be able to see the first floor. The Bishop’s Mansion, or Bishop’s residence as it is also known, is one of five homes on this year’s Holiday Home Tour and Soiree, which runs from 6-9 p.m. The home of Palmer Woods developer Charles Burton Woods also will be on the tour. Tickets are $85 (see box for details). Palmer Woods, north of 7 Mile and west of Woodward, is Michigan’s first platted subdivision. Situated on land once owned by U.S. Sen. Thomas Palmer, his estate sold the land that would become Palmer Woods to developer Charles Burton in 1915 to create a first-class subdivision. The 188-acre subdivision is known for its winding streets, canopy trees and regal homes that reflect a variety of architectural styles, with Tudor Revival as it the most prevalent style. Some of the biggest names in architecture — Frank Lloyd Wright, Minoru Yamasaki and Albert Kahn — built homes there for some of the biggest names in Detroit industry. Two of the seven Fisher brothers called Palmer Woods home. Not for the Staring Contest part, but for the way Batman's captors kneel before Kal-El as he comes down the hallway. Remember Jor-El's line to his wife as they prepared to launch their only child to the stars? "He will be a god to them." Apparently, Zach Snyder didn't mean that as a throwaway. I liked Man of Steel, even if it needed some editing down--after a while, it was just way too much mayhem. This might be a quieter movie, and thus all the better for it. Ours was wonderful--Heather cooked another perfect 19lb. bird, I finished turning the leftovers into soup base on Monday evening, and we've gotten some of our Christmas shopping done. So, that explains most of the radio silence. The remainder is that I've been working on a couple of pieces for Steve Skojec's OnePeterFive which are going into rotation there shortly. I'll actually be the second Price spouse to write for the endeavor, as my Much Better Half posted a nice essay earlier this year. So, smoke if you got 'em.